We all know that the countdown to Halloween has begun, and we know that our time is sometimes limited due to our hectic schedules. But there is a quick and easy way to create an almost free Halloween prop in a few minutes. Let me show you how! First, grab your branch cutters or a little hand saw and head out into your woods. To make this easy, look first for little branches that might be lying on the ground. If you can’t find any, which I would find it hard to believe that you couldn’t, you will need to saw or snip off a few small branches. Carry those branches back home and snip off any little pieces of branches so you are left with just one long branch. Now carefully lean them into each other to kinda make a branch t-pee. Once you get them in a shape you like, take some jute and tie them up where all the branches meet. (I would suggest you do all of this “where” you are planning on putting this prop in your yard so you don’t have to carry it afterwards) Make sure you jam each stick a little bit into the ground for stability. The next thing that I did was bring up one of our black witches cauldron from storage. At first, I wanted to “hang” the cauldron from the sticks, but the cauldron did not have any hooks, so I had to MacGyver something. I took one of our tomato cages and cut off the bottom section with wire cutters and placed the cauldron on top of it. THIS WORKED OUT PERFECTLY! The next item I grabbed was some fire wood we have behind the garage and stacked them around the cauldron. This is making the effect that the cauldron is stacked on top of wood. Next, I balled up a set of white Christmas lights under the cauldron (inside the tomato cage frame) and turned them on! WOW! When I took this photograph, it actually looks like a fire underneath the cauldron. I am going to also add an orange set of lights underneath the cauldron too, to give the “fire” a more realistic look. 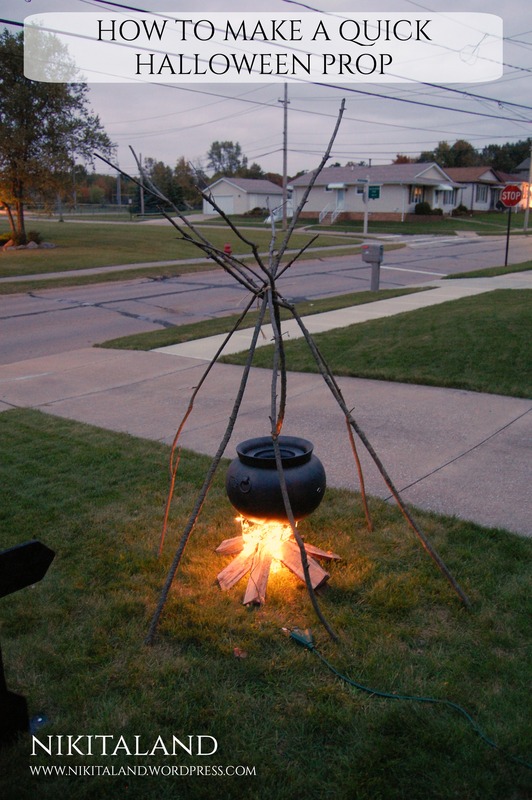 Now comes the fun part…I am going to grab two of our skellies and have them stand around the cauldron! I will have one posed as if he is “warming up his hands” by the fire, and the other one will be “roasting a marshmallow”! This Halloween prop was made for free, because I already had the cauldron, lights and tomato cage, and the wood & branches were free! Yeah! Hee hee, don’t you just love Halloween! This entry was posted in Halloween and tagged DIY, DIY Halloween Props, Halloween, Halloween Props, How to Make a Quick Halloween Prop by Nikitaland. Bookmark the permalink. Oh wow, we had 153 kids over here (and yes, I counted)! Our weather was really cold and it rained for us. I think our days of warm weather is gone for good this year. Bummer. Gotta go get the snow shovel out. What a great DIY project, thanks! Definitely sharing it. Hi Cathy! It turned out better than I expected! The best part is that it was free to make! I hope you try making it for your yard for Halloween! Holy smokes! I saw that and was like, what is she thinking?? That doesn’t look safe! I Love it!!! Hee hee hee, you just gotta love Halloween! I am already getting a lot of gawkers who drive past the house. They slow down to take a look. I am so glad you liked my new prop, it sure turned out well! holy crap it did look like a real fire. What a cool prop! I know! Isn’t it amazing on how it really looks like fire! I also added a string of orange lights to the white lights on it tonight and added one Skelly in front of the cauldron. Now, it is coming together quite nicely! I love this Halloween prop that cost us nothing to make! I bet you could make one too!!!! Gah! I wondered about the “fire” underneath. Lights! Who knew. It’s genius! Oh yes…repurposing is key in holiday decorating! Now I want to go find some more branches to see what else I can make for FREE! Cute? I wasn’t going for cute! LOL Thanks for stopping by! How are things with you on your end of the world? Hi Guys! Thanks! I know that everyone could find a few branches to make one too!